The IP SS7 stack has been a focus of the OpenSS7 project for some time as well. The SIGTRAN stack components provide the basis for redundancy and distribution in OpenSS7 and provide the principle glue between the SS7 protocol levels in a redundant and distributed system. 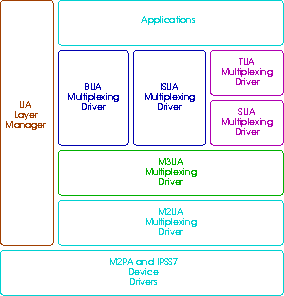 IP SS7 stack components include IPSS7, M2PA, M2UA, M3UA, SUA, TUA and TALI.